This CD contains every piece that Mozart wrote for one or two solo pianos. 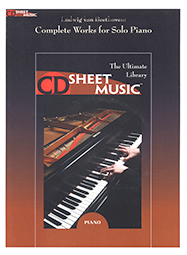 Included are all the Sonatas, Variations, easier pieces, and complete 4-hand music - over 700 pages of music. Wolfgang Amadeus Mozart was born in Salzburg, Austria, in 1756 and died in Vienna, Austria, in 1791.